As much as I love sweets, in truth, because of my Celiac an other factors, I can’t eat a lot of sugar. So I’ve decided to start posting what I eat every day for a sweet treat, in addition to the yummy special occasion desserts. I am not going to lie, these apple tartlets do not taste like hot out of the oven apple pie because it does not have all that sugar. But it does make a nice sweet apple treat when you just have to have something. Some recipes say that they are healthy, or paleo or sugar-free and then they are loaded with sugar supplements like xylitol, stevia, and maple syrup. Although some of my recipes do use stevia, when I say healthy I try not to make any substitutions for all natural goodness. To have a fully raw version of this recipe, you have to have a food dehydrator to keep the food temperature under 118 degrees. If you do not have a dehydrator, don’t worry, it won’t be raw, but cooked at a low temp in the oven it will still have great health benefits. I am the worst at sharing recipes because I make everything by the grace of God, by throwing things togehter and it just comes out right. I can smell and taste when it’s just right, so these are approximations. Taste test as you go and add or substract a little as it fits your palete. Note: for a sweeter filling use dates instead of banana. Please keep in mind that dates have a much higher sugar content than bananas. Blend all of the crust ingredients, adding just enough water to blend in a food processor or blender. If you are not looking to follow a raw diet, feel free to add some coconut milk instead of water. 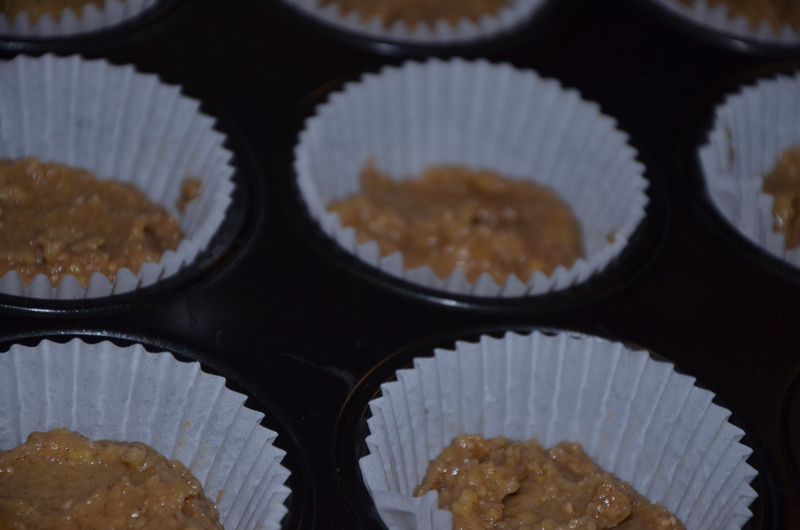 Place crust “batter” into lined cupcake tins, filling 1/2 in. or a wee bit more as it will shrink down when dried. 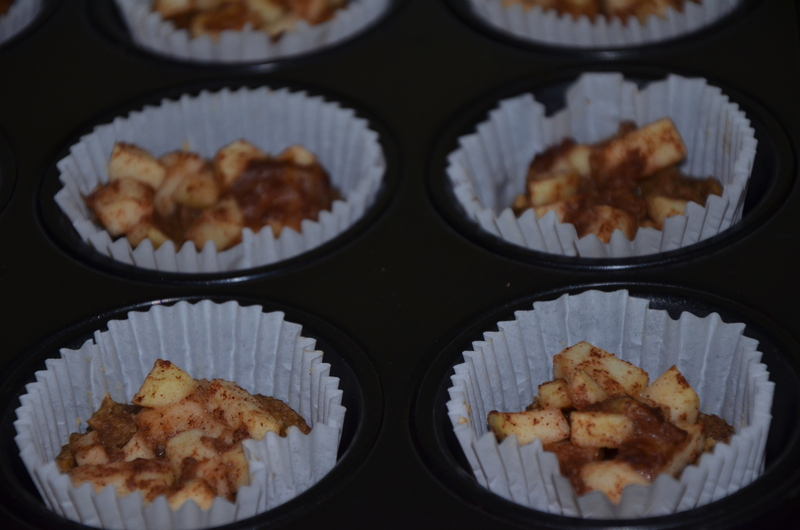 To make the filling, dice your apples and mix all the apple tartlet filling ingredients together. Taste to make sure that it has that great balance of tang and sweetness. If you are dehydrating, put the crusts into the dehydrator and leave in for around 12hrs. Depending on you heat setting, check every few hrs to make sure the liners are doing ok and for crust firmness. When the crusts are no longer wet or sticky but still plyable you will want to add your apple filling and return them to the dehyrator. Once they are done, keep them in the refridgerator as they will not be competely dried but have a “cooked” consistency. As everything is preservative free, there is not a long shelf life with the dehydrator method, so it would be a good idea to share. If you are cooking the apple tartlets in the oven, preheat your oven at the lowest possible heat setting. 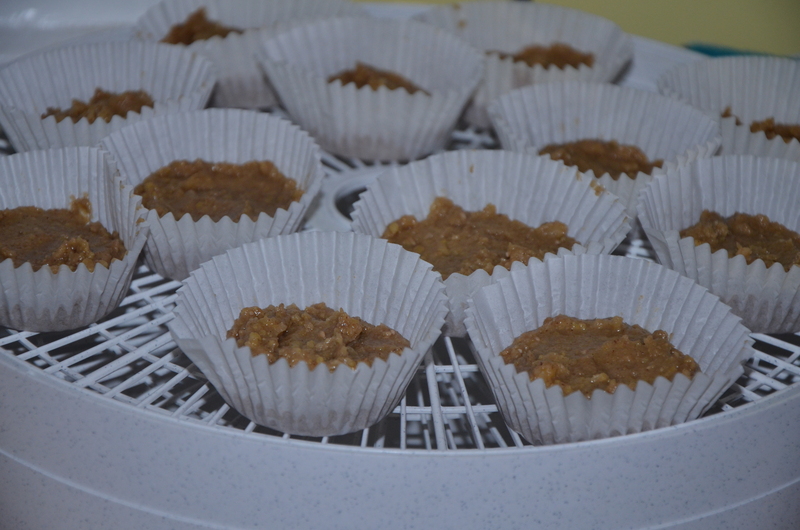 Leaving your “crust” in the cupcake tin, put them in the oven and leave them in for a few hours. Check by pressing lightly on the crust surface. If you can press softly and your finger does not stick to it or go through the batter, but leaves a soft indent, then add the apple filling to the top. Your tartlets are done when the apples are soft, but not soggy. Apple Tartlet Crusts going into the oven. This does take more time than a regular pie, but after making it once you will be able to put everything in the dehyrator or the oven and just walk away. The second time is always much faster than the first. I assure you, it will be worth it. Always keep your finished product in the refrigerator as it is highly perishable. As in everything, eat these in moderation. Especially if you are not used to eating high protien, high fiber foods, these will send you running for the little boys or girls room if you try to eat a plate full in one sitting. The key to these is to put in enough spices in as to not taste the banana. The banana is there for sweetness not for taste, otherwise all of your raw food recipes will end up tasting like banana bread. If you do not have a dehydrator or just don’t feel like baking, feel free to contact me to place an order. Like this recipe? Using the contact field below e-mail me to sign-up to recieve free recipes. I hope that this recipe is a blessing to your tummy and to your day! Want to receive coupons? Sign up to follow me on this website, refer a friend or write a review for By Grace Cakes on Yellowpages.com, Yelp, or +Google to recieve a Valentines’ Day discount! Just e-mail me to let me know which you have participated in and I’ll send you your coupon!